Here are some hundreds of amateur radio recordings, including QSO, aurora traffic, meteor scatter, communications with ISS crew and the sound of various transmission modes that you can hear on HF and VHF bands. 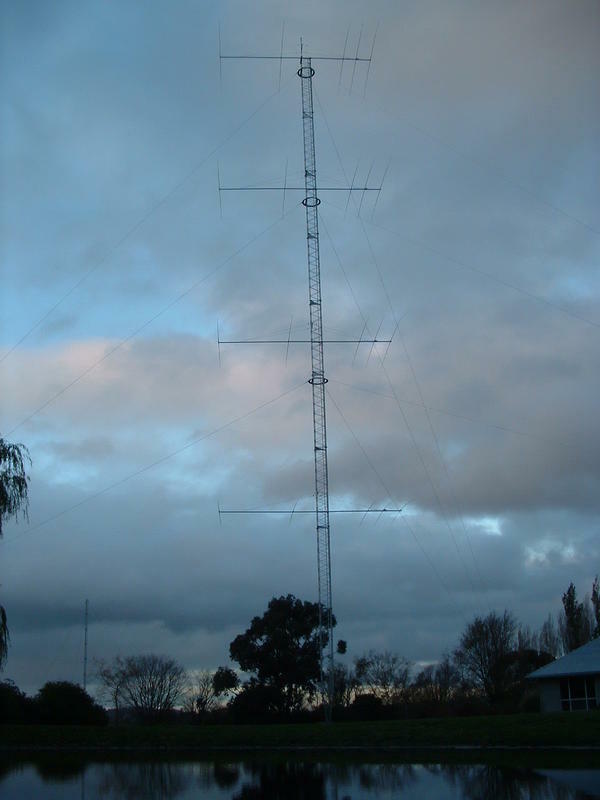 Most HF recordings were performed using a transceiver connected to either a G5RV dipole or a simple vertical antenna installed in LX or ON. No filtering (DSP) nor RIT or IF Shift was used to preserve the original sound. As usual, many DX stations were subject to big pile-ups. Note that you can identify the country of each call sign listed below in downloading the sheet of DXCC entities (xls). In some recordings we do not always hear comments of some radio amateurs because of the working conditions (split of RX/TX, time of the day, sensitivity of the receive system, location and distance of both contacts, fading aka QSB, and static aka QRN). For RF or digital messages listed in the "Transmission modes section", you can use multi-mode decoders to translate them. Read also my history of amateur radio for more detail about AMTOR and other PSK31 modes (mainly from years 1980s). 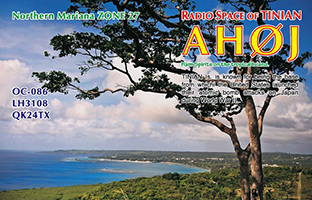 A DX station in pray of pile-ups : AH0J, Mariana islands. QSL released in 2015. Listen to the pile-up. You will find additional recordings of digital modes on KB9UKD's website, rare CW/SSB QSO on K8CX's website, and recordings of broadcast stations on BCLworld. At last, since 2014 a signal identification guide including tens of audio files with a waterfall display is available on SigidWiki, a free wiki that you can complete with your own recordings and descriptions. You will find on this page numerous scientific recordings like the sound of meteor showers, auroral emissions, geomagnetic storms, solar flares, Jupiter and Saturn hisses and bursts, pulsars, interstellar palsma, natural phenomena, and more. You will find on this page recordings related to astronautic events, transmissions from satellite and other spacecrafts, as well as reports from astronauts and cosmonauts on orbit. You will find on this page commentaries extracted from films, sounds and music samples used on this site to illustrate some subjects. Check also my animations for hundreds other videos and films. In addition, audio CDs gathering sounds of tens of transmission modes can be purchased from Gerhard Beck and Klingenfuss websites. Documents listing a callsign or a link are on loan by their author and copyrighted. If you want to use these files, please ask first the permission to the concerned person. Even if a QSO can be assimilated to a public transmission on the air, shared with listeners too, like any intellectual activity, the QSO's initiator holds the right to grant or deny the publishing of his or her communication. The Message of President Roosevelt qualifying the airraid on Pearl Harbor as a "day of infamy". "Ici Londres. Veuillez écouter maintenant quelques messages personnels. L'éléphant s'est cassé une défense, nous répétons..."
Reconstitution by the author of the Titanic (MGY) CW transmission at 40 WPM sending "CQD CQD SOS DE MGY MGY REQUIR IMEDIAT ASISTANC POSITION 41.46 N 50.14 W"
HamSphere (v3.0) communication between amateurs. Document HamSphere. Recording from Suitsat, alias RS0RS, delivered on the air on February 17, 2006 including the SSTV message in the second part. Recorded by VE6BLD on 145.990 MHz FM at 0143 UTC. Suitsat still worked that day until about 10:59 UTC (received by N2SPI) then ceased trasmitting. Recording from Suitsat, alias RS0RS, delivered on the air on February 8, 2006. Recorded by VE6BLD on 145.990 MHz FM. Suitsat, alias RS0RS message (noisy with fading) delivered on the air on February 6, 2006. Recorded by VE6BLD on 145.990 MHz FM. The message is "This is suitsat-1 amateur radio station RS0RS. Greetings to the students around the world. This is a message from [...] to americans and the united states. We share a mutual excitement about the future of space travel. The USA special word is FREEDOM". The transmitter on-board Suisat was a Kenwood TH-K2 handheld transceiver emitting with 1W PEP. 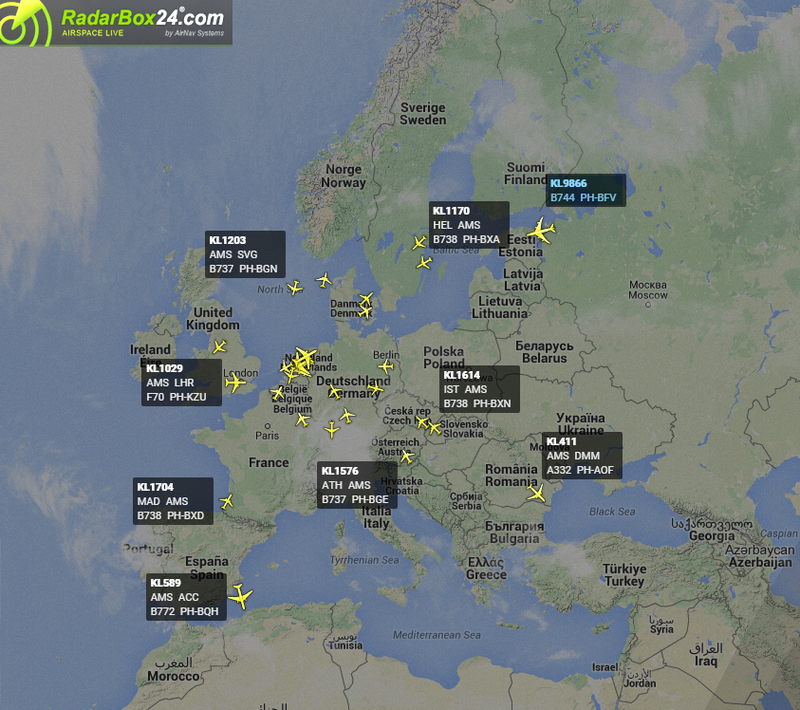 Its signal was loud and clear in all countries from PY, K, VE, NL, AU or ZS. Unfortunately, Suitsat batteries have frozen after 12 days. It ceased all transmission as soon as in voltage dropped below 9 V although the computer was still active down to 3 V. More information on AMSAT or PD0RKC. Fabiano, PY5RX working NA1SS (Bill McArthur) in February 12, 2006 at 13:12 UTC given him a status of receive conditions of Suitsat. NA1SS (Bill McArthur) during his EVA after have launched Suitsat on February 6, 2006 asking capcom at Houston about receive conditions at ground. Capcom was also curious about Bill's 1000 radio amateurs contacts and how he manage his QSL. Recorded by PD0RKC. Communication with Mir recorded on Aug 5, 1999 (format VQF). Document Thierry Fricot. 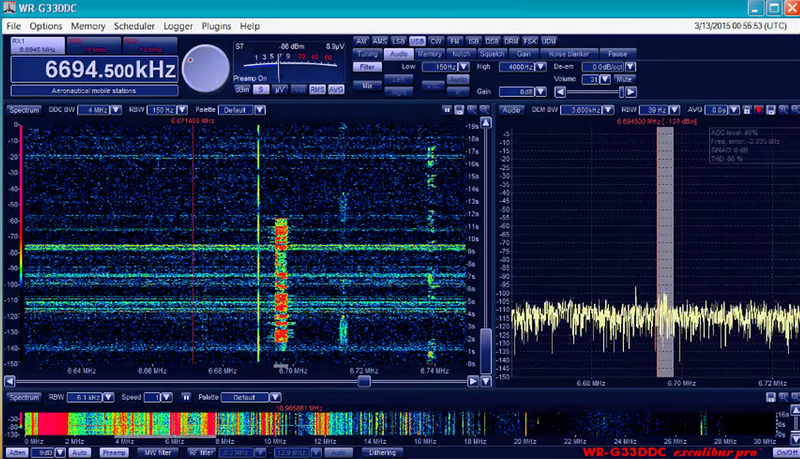 F5OUX working VK4CQ in Australia at 00:30 on May 21, 2015 on 28.430 MHz, skip distance of 23516 km, SSN=36. 10-element beam, 50W. NB. There was a radio blackout 72 hours earlier. Bharathi Prasad, VU2RBI calling for help from Sri Lanka after the tsunami of december 26, 2004. She was in DX-pedition with VU4NRO on Andaman Island when the earthquake and the tsunami hit the region. She immediately shifted to an emergency operation. The emergeny network worked on the primary frequency of 14.190 MHz and on Echolink. KB3JUV giving a status report about hurricane Isabel to Net control of National Hurricane Center via Echolink, 18 Sep 2003, relay 147.060 kHz. Khaos during the pile-up for E41WT in Palestine on 20m (the operator uses the call by number but it was not respected by amateurs forcing the operator to QRT for 1 hour). FR5CB trying to work OK1FGS on 20m through the QRM. On the cluster, GW3RIH qualified the situation "The ZOO is open" ! VP8LP would have well continued working european stations but after have been disturbed by impatient and tactless amateurs from EA, he decided to QRT due to QRM this evening on 17m. ZD7VC calling Asia but Europe and North Africa replywithout listening on 20m. French cosmonaut on Mir disturbed by tactless amateur (in French). 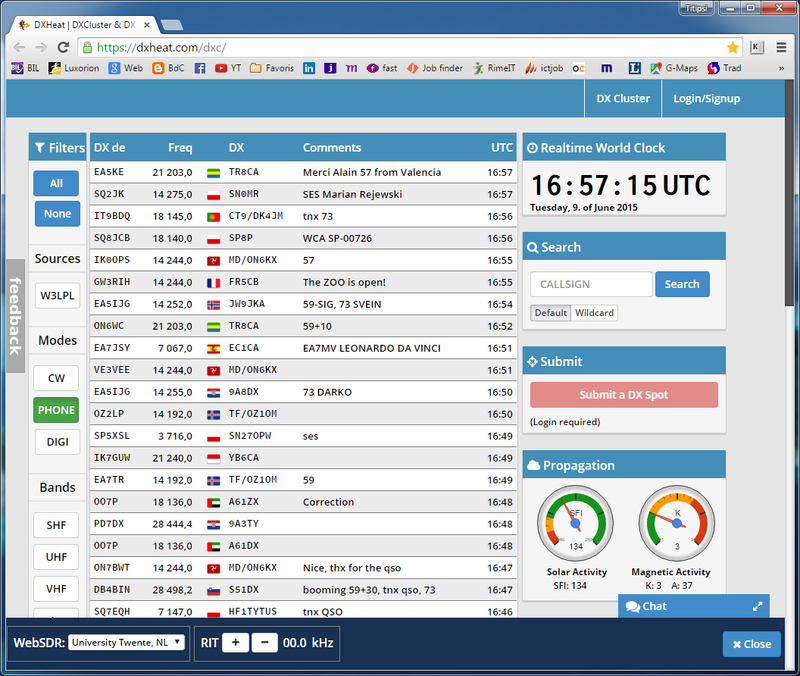 GB3SEE beacon in JT65 mode (USB) on 1036.8821 MHz or 3 cm-band (SHF), 20h51 UT, June 2015, and repeating. More info about JT65 on YouTube. DominoEX in IFK mode (Incremental Frequency Keying), USB. Can be hear anywhere between 03-30 MHz. Used to send text message. ANDVT (Advanced Narrowband Digital Voice Terminal) used by US Gov. and Mil. ERMES (European Radio Message System), 169413 kHz, NFM. Paging system developed by ESTI. OTHR (Over The Horizon Radar) 29B6 "Kontayner" on 14530 kHz from Russia (some state that it is located in Singapore, others in Iran, maybe on other frequencies). There is the same noise at 13465,14260, 15060, 19745, 28400 and 28500 kHz. Most of the time it emits at night but also at daytime on weekends. Its bandwidth is 20 kHz but creates QRM over 300 kHz up and down, including in amateur bands where it is the loudest (in USB). Its spectrum at 14260 kHz, in the amateur band, and 14430 kHz is stunning. Read this radio news too released in August 2014. In theory national regulators, if needed in cooperation with ITU, should handle this issue. WWV and WWVH signals. Documents Thierry Fricot.